Are you one of the millions of people who wear regular or soft contact lenses? If so it is important you take steps to clean them properly. Cleaning your contact lenses will help promote good health and reduce your risk of infection. It will also help you see better. They way you clean your contact lenses will depend on the type of contact lens you have. Read on to find out more about proper care and cleaning for your contact lenses. Soft contact lenses are more likely than hard lenses to absorb pollutants in the air and in the environment including smoke, sprays, fumes and other substances. They can also absorb protein from your tears and have protein deposits. Simply cleaning your lenses daily will help remove build up from these substances and help reduce eye irritation. Any time you remove your soft contact lenses you will need to clean them. There are special lens cleaners designed for these types of lenses. Wash your hands. If you clean your lenses with dirty hands you'll just transfer the germs from your hands to your lenses. Remove one of your contact lenses and place in the center of the palm of your hands. Add a few drops of cleaning solution to the outer surface of the lens. Using the pad of your index finger on your opposite hand, gently rub the cleaning solution into the lens for about one minute with a side to side motion. Rinse your lens with a cleaning solution then replace in the lens case. Never rinse your soft lenses with water. Fill the lens case with cleaning solution. Always use new solution and never "top off" from the night before. Clean the 2nd lens the same way. Some soft lenses require special cleaning processes. Your eye doctor or eye care provider may at times recommend a heat cleaning process that they can achieve in shop. Be sure to ask your optician what types of lenses may require this process. If you wear hard contact lenses you will need to clean and disinfect your lenses each time you wear them with cleansing solutions specially designed for your rigid lenses. The type of lens you have will dictate the kind of solution you use and the frequency with which you clean your lenses. Rigid contact lenses are cleaned just like soft contact lenses only you need to rinse the contact lenses in fresh tap water after rubbing the cleaning solution on the surface of the lens. You will also have to fill the lens case with rigid contact cleaning solution after rinsing. If you don't rinse cleaning solution from the hard contact lenses completely, the lens will irritate your eye. If this happens flush your eye with water and rinse the lens again. Always start cleaning with the same contact lens (left eye for example) so you don't mix your lenses. Avoid sleeping with contact lenses in. Sterilize your lens case once a week to help reduce your risk of infection. Lens case should be discarded every 3 months and replaced with a new one. Try plain rather than moisturizing or antibacterial soap when washing your hands to avoid contaminating lens. Avoid wearing lotion on your hands as this may get on your lens when cleaning. Fill your contact lens case with solution before replacing lens in case to help avoid scratching the rigid lenses against the case and damage. Always keep your contact lenses moist. Avoid using permanent or lash building mascaras as these can create deposits on contact lenses that are difficult to remove. Use oil free foundation and other moisturizers when wearing contact lenses. Avoid wearing contacts while swimming. Soft lenses may absorb chemicals from the water and hard lenses may pop out of eye. 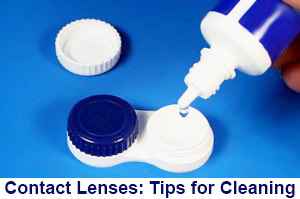 Avoid touching the tips of cleaning solutions for your lenses as this can contaminate the cleaning solution bottle. Do not use aerosol sprays around contact lenses. Contact Lenses in Children - A good or bad choice?